The gyms almost always have a Weight Bench. Most often, they perform 1-2 exercises for the muscles of the press, although there are much more opportunities. 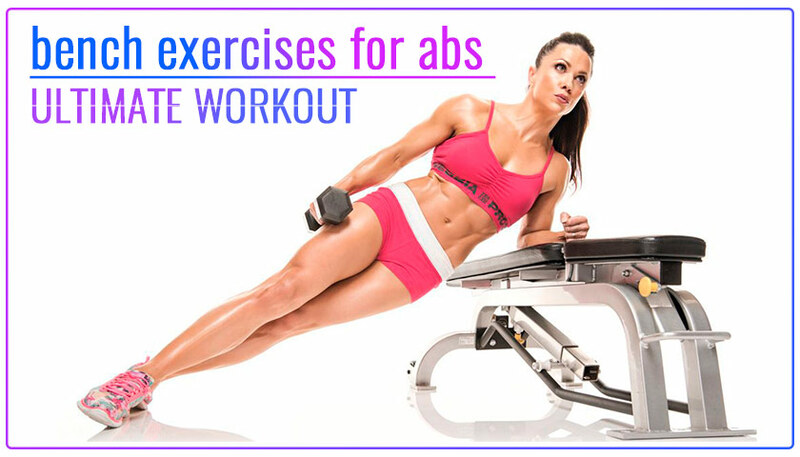 We decided to collect the best exercises and offer a variety of ABS Exercises On a Bench. It will allow you to get a great variety and efficiency of training. There are a number of basic exercises. In addition, there may be variations that duplicate the basic principle of implementation. Also, training options depend on the type of bench available. So consider basic several exercises. For this exercise you need to lie back on the bench. To make it easier to keep the balance hand is better positioned along the body. Take the bench. In the starting position with your legs raised along the body parallel to the floor. With the effort of raising legs to 90-degree angle with the body. Legs should be straight. Further, slow controlled lowering the feet to the starting position. The exercise is similar to the previous one. In this case, we sit on the bench, hold hands. Legs straight and parallel to the floor. Raising his legs bend them in the knee to touch the chest. Keep your legs together. The reverse movement is performed slowly. This exercise allows you to constantly keep the muscles of the press in tension. It is important to perform it slowly. Accelerating is easy to lose balance. In this variation, it is more difficult to keep the balance. Because of this, additional muscle stabilizers are included in the work. In addition, additional weight increases the necessary effort. In addition to the lifts, you can perform movements to the sides to include the oblique muscles of the press in the work. Using the bench, you can replace the usual bar on its variation. In this case, you put your feet on the floor and on the bench. It shifts the focus of the load on the upper part of the ABS. In addition to the straight plank, it is convenient to perform a side plank resting on the forearm. To increase load you can use Hanley took it in his free hand. A straight or inclined bench can be used for this exercise. Lie back on the bench. Hands holding the bench behind his head. Keep your legs straight. This will be our starting position. Lift your legs as high up as possible without lifting your lower back off the surface of the bench. Returning to the starting position, hold the body and gently lower the legs. For this exercise, the necessary incline bench with cushion for mounting feet and additional weights. It could be a dumbbell, a weight. Taking the starting position sitting on the bench, take the dumbbell with both hands. Staying at an angle of 90 degrees to the bench perform alternate turns to the side with the maximum wire. It can be both independent exercise, and combined with twists. In this case, lie down on the bench. Raise the body holding the extra weight with both hands in front of you. Mid rise start to turn the housing to the end of the climb to reach the maximum rotation angle of the housing. We hope this information was useful for you. We will be glad to receive your feedback. Any questions or additions. Train regularly and achieve your goals.